It was the end of last year when Arcen Games, makers of AI War: Fleet Command, told us they had two cooperative titles in the pipeline for 2010. The first was called A Valley Without Wind, which was a take on the tower defense genre. The game has since been bumped to 2011, but the second was an unnamed puzzle game with an addictive but simple mechanic. Today Arcen has named the puzzle game and announced a beta starting very soon. The game is called Tidalis and it looks to be somewhat similar to other color matching puzzle games that are out now like Bejeweled, though it plays more closely to a game like Meteos. The unique mechanic appears to be the way the game clears and matches blocks. From the teaser video it looks like you'll match colors, but they don't need to be next to each other. Blocks fall from the top of the board, but you are unable to move them in anyway. An arrow on the block points the directions the match will occur, and when you right click it, the block follows the path of the arrow hitting all the same colored blocks and changing directions with each block's respective arrow it to clear. 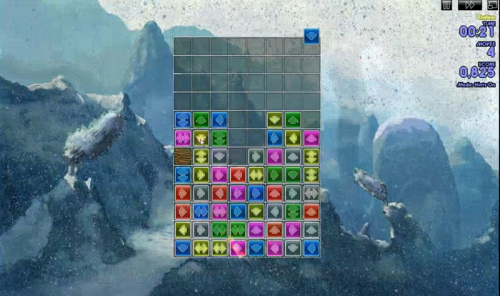 All blocks clear at the same time and then collapse, trigger the blocks below to unleash the next chain. The strategy come with how players rotate their blocks to set up chains with the arrows. Tidalis promises a ton of modes of play including a single player adventure that'll support two player co-op play. More details on the game's modes can be found on the official site. While the video and site don't show or tell much of the co-op play, we'll exclusively unveil the details of it tomorrow! So be sure to check back! Tidalis will release in early June with a beta starting next week on the PC and MAC for those that pre-order. And remember to check back tomorrow to hear all about the co-op details of Tidalis!